Back in December, I posted that longfin smelt may be gone. Numbers were way down and early winter 2017 larvae surveys indicated a very poor spawn. 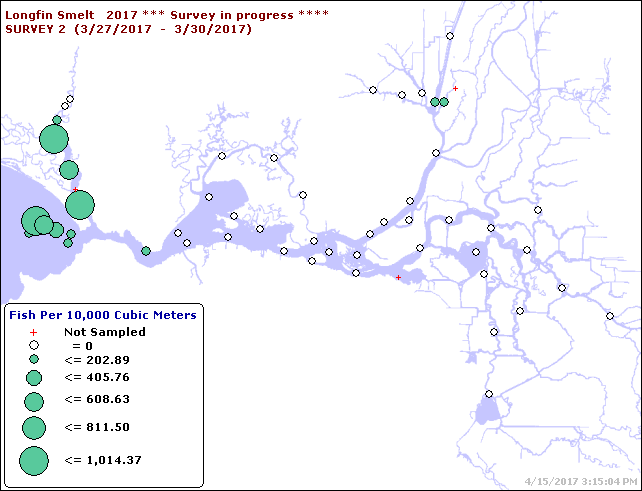 But suddenly in March, larval smelt began showing up in the CDFW 20-mm survey in San Pablo Bay and in the Napa River (Figure 1). A bunch of adult longfin must have come in from the ocean and surrounding San Francisco Bay with this winter’s very high Delta outflows, and spawned in the Napa River. While these larval densities are one or two orders of magnitude below previous wet year abundance (1999, 2006, and 2011), they are much higher than those observed in other years over the past decade. Despite very low recruitment during the recent drought (2013-2015), they were able to muster enough 1-2 year-old adult spawners from around the Bay and nearby ocean to provide a decent spawn in the Napa River. There appears to be some hope for longfin smelt after all. Figure 1. Longfin smelt catch densities in March 2017 20-mm Survey. Source : CDFW 20-mm Survey. Late-fall-run Chinook salmon are unique to the Sacramento River. They migrate upstream to spawn below Shasta Reservoir in the Sacramento River in the late fall and early winter. Peak spawning is in the winter months. With emergence in the spring months, juveniles over-summer in the upper river above and below Red Bluff before commencing their smolt migration toward the ocean in the fall, when the lower river cools. Numbers (escapement) of adults reaching the upper river spawning grounds have been estimated at the Red Bluff Diversion Dam (RBDD) fish ladders, in redd surveys, and in carcass surveys. The counts were accurate until 1991. Beginning in 1992 the RBDD gates were lifted in fall and winter, and ladder counts ceased. Accurate counts were obtained through other methods (aerial surveys, redd counts, and carcass surveys) beginning in 1998. A plot of escapement from CDFW’s GrandTab file (Figure 1) also shows the contribution of the Coleman hatchery returns in the escapement total. The inaccurate escapement estimates from the 1992-1993 fall/winter to the 1996-1997 fall/winter show clearly in Figure 1. Better spawning conditions – higher flows, more gravel spawning habitat. Better incubation conditions – less redd stranding, better redd survival. More floodplain rearing habitat for fry. Less predation on juveniles from spring through fall. Better water temperatures spring through fall in rearing reach. Improved fall emigration conditions (flows, water temperatures, less predation, improved passage in the lower river and Bay-Delta). Recruitment has been consistently low in recent drought years, which lacked the positive benefits I listed above. Removal of the RBDD gates after 1992, screening of large diversions, and more protective habitat conditions (flows and water temperatures) likely contributed to the population resurgence in the wetter year periods from 1995-2006. However, the droughts years from 2007-2015 have driven the population to such a low level that the run is now primarily sustained by hatchery production. A recent assessment by CDFW1 recognizes the roles of these stressors on the late–fall-run salmon population. I quote from the assessment and comment below. The effects of RBDD were more subtle. This dam apparently delayed passage to upstream spawning areas and also concentrated predators, increasing mortality on out- migrating smolts. Kope and Botsford (1990) documented that the overall decline of Sacramento River salmon was closely tied to the construction of RBDD. Raising the dam’s gates for much of the year to allow salmon passage apparently alleviated much of this problem. The gates are now open year-round, allowing uninhibited passage of adult and juvenile late fall-run Chinook salmon. Comment: Eliminating the RBDD migration blockage and predator hotspot was important, but it also allowed predator access to the upper river in the spring-fall rearing period. The numbers of river spawners has continued to decline while the proportion of hatchery returns increases. Comment: The rate is no longer considered low. The population’s viability is in question with the large contribution by the hatchery. Large pumping stations in the southern Sacramento-San Joaquin Rivers Delta (Delta) divert approximately 40% of the historic Delta flows, resulting in substantial modifications in flow direction (Nichols et al. 1986). Pumping also increases the likelihood of out-migrating smolts entering the interior delta, where longer migration routes, impaired water quality, increased predation, and entrainment result in higher mortality rates (Perry et al. 2010). Comment: Wild and hatchery-released smolts move downstream toward the Delta with the first fall rains (Figure 3). Those that reach the Delta before the end of December are subject to an open Delta Cross Channel and high exports (Figure 4), and high rates of predation, which together likely contribute to the very low return rate of the late fall hatchery and wild smolts, especially from drier years. Hatcheries. Late fall-run Chinook salmon have been reared at Coleman National Fish Hatchery on Battle Creek since the 1950s, even though the run was not formally recognized until 1973 (Williams 2006). The current production goal is one million smolts per year, which are released into Battle Creek from November through January (Williams 2006). Hatchery broodstock selection for late fall-run fish includes both fish returning to Coleman National Fish Hatchery and those trapped below Keswick Dam. Large numbers are needed because survival rates are low (0.78% at Coleman). Comment: The return rate of late–fall-run smolts from Coleman as adults to sport and commercial fisheries is among the lowest from Central Valley salmon hatcheries (Figure 5), despite late–fall-run smolts being the largest hatchery smolts at release. Provide a coincident flow pulse from Shasta Reservoir to the first downstream tributary rain pulse to stimulate wild late-fall-run smolt emigration from the Redding reach below Shasta/Keswick. In the event of significant natural fall flow pulses that stimulate emigration of wild late–fall-run smolts from the upper river, add releases of pulse flows from the Feather and American rivers, close the Delta Cross Channel, and reduce Delta exports to enhance passage to the Bay and Ocean. 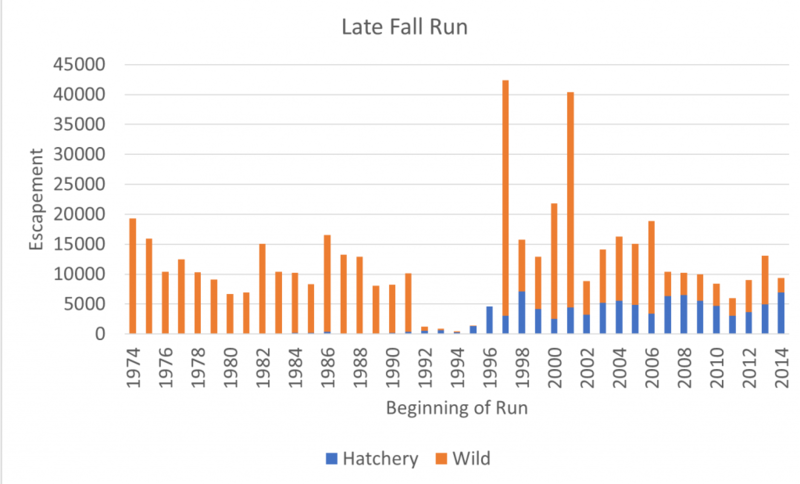 In drier years with minimal fall-winter rains, consider barging late–fall-run hatchery smolts from Knights Landing on the lower Sacramento River above the Feather River to the Bay. Straying problems identified for truck-transported late–fall-run hatchery smolts may be reduced with this approach, while markedly increasing smolt survival to the ocean. Maintaining the barge route to Sacramento water on the west side of the river may minimize imprinting (and subsequent straying) to the Feather and American rivers. Figure 1. Late-fall-run Chinook salmon escapement estimates to upper Sacramento River 1974-2014. “Wild” means counted in the river not at the hatchery. Wild spawners may include a high proportion of hatchery origin adult salmon. Source: CDFW GrandTab. Figure 2. 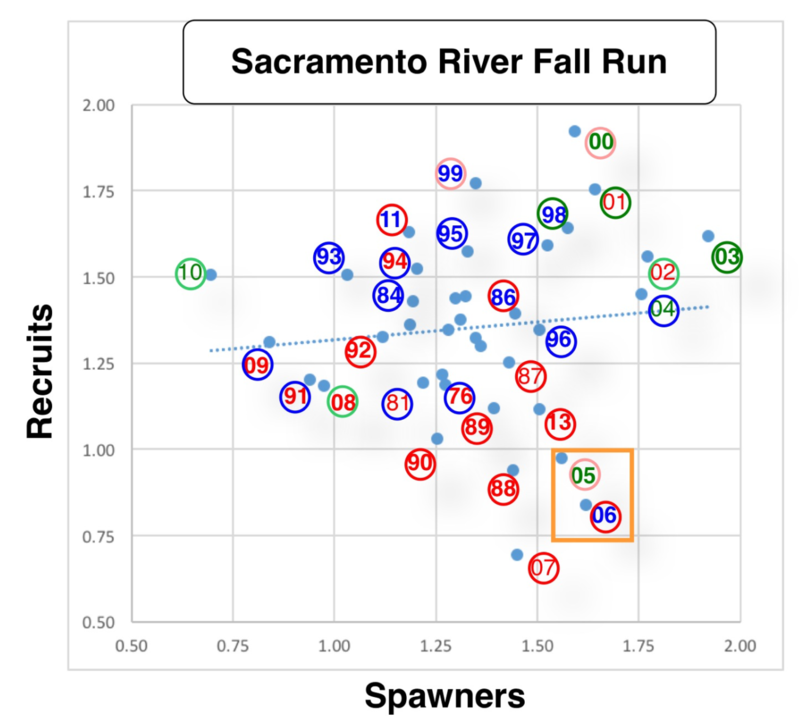 Spawner-recruitment relationship for late-fall-run Chinook salmon in the upper Sacramento River below Shasta Reservoir. Numbers are Log10 -2 transformed. Year numbers are for rearing year in freshwater. 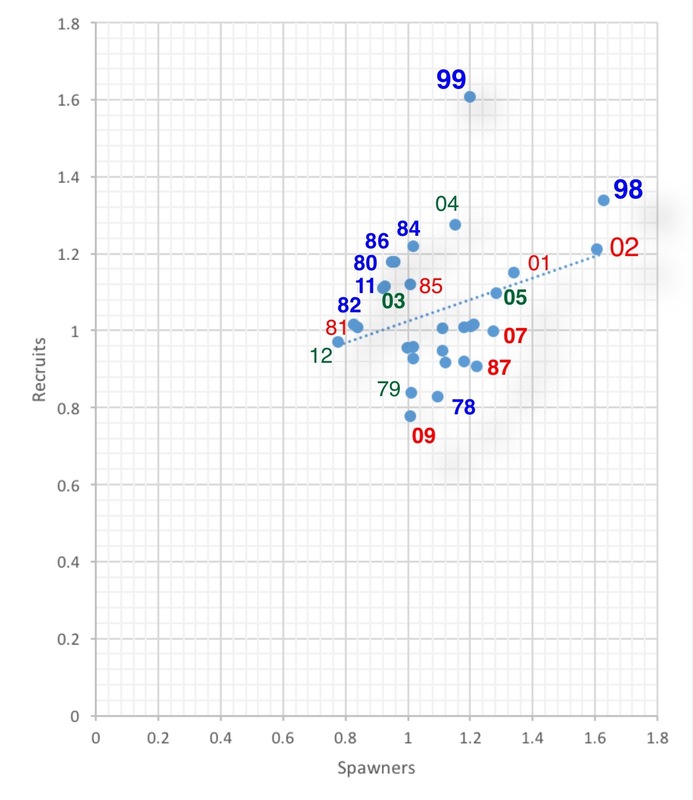 For example: 99 dot represents rearing year when spawners from 1998-1999 returned as recruits in 2002-2003. Red bold designates critical water year. Red non-bold designates dry water year. Green bold is above-normal water year. Green non-bold is below-normal water year. Blue number is wet water year. Relationship is significantly positive with higher recruitment per spawner in wet years. Figure 5. Return rate in sport and commercial fisheries of tagged Central Valley hatchery salmon. CFHLh denotes late fall releases at Coleman hatchery. Other release locations are Feather River (FRH), American River (NMF), Mokelumne River (MOK), Merced River (MER), and Sacramento River (Sac). W denotes winter-run, S spring-run, and F fall-run. tib denotes Tiburon, t denotes trucked, and h denotes hatchery site release. Source: CDFW. This past November’s science conference on the Bay-Delta included a discussion on Delta smelt.1 Some of the discussion points are presented in this post, with my comments. Comment: Delta smelt remain highly adapted to the Bay-Delta Estuary. However the habitats are so disturbed, especially during droughts, that little recruitment is possible, resulting in a long term decline in the adult spawning population that may not be reversible. Wet years and improved water management could possibly reverse this pattern and bring population recoveries, similar to those in 2010 and 2011. Comment: In nearly every case the “smoke” emanates from poor water management in dry and average water years, when Delta inflows, outflows, and exports are manipulated in ways that disturb the ecosystem. The other factors are simply secondary reactions to the gun’s discharge. Comment: It is not a matter of resilience. It is simply a matter of survival and recruitment, and maintenance of a viable spawning population. It is not the drought, but how the water management rules were weakened in the drought. In drought, the rules must be enhanced and enforced, not weakened, to protect the species. Comment: This is just simply confusing. Coequal protection of beneficial uses does not mean that fish get 50% of water and other uses get 50%. And someone would have to be a little more precise in defining 50% (or whatever percent) of what. Fish have basic needs that protect them from extinction. Water management must work around these needs. The problem is most acute in dry years and droughts. But better allocation of water is needed in all years so enough is available at least for triage of all uses in multi-year droughts. Comment: The responsibility for this grand failure does not lie with the scientists. It lies with the water managers and the agencies who compromised in negotiations on water rights, water quality standards, and biological opinions. Co-equal goals does not mean “cutting the baby in half.” It means equally maintaining the viability of the two beneficial uses, which obviously does not happen. Comment: Yes it is very difficult to revive half a baby. The important thing is to keep the next baby, if there is one (however small), alive and healthy. If there is, maybe we can make an extra effort in nurturing it to adulthood. Comment: There most certainly is a “silver bullet,” but it is made of H2O. Comment: This is exactly why the Endangered Species Act was enacted. Are we going to protect the largest and most important estuary in California and the western United States or not? Comment: If the Strategy outlined was so exciting, why wasn’t any of it implemented in 2016? The Strategy simply is cutting the baby into thirds.2 “Kudos” to the State for simply recognizing its long-held responsibility. Comment: Yes, water is the silver bullet in the form of Delta outflow. Think of Delta outflow as the powder charge that delivers the silver bullet. However, a little bit of hot, dirty, ag water in summer from the Yolo Bypass is not3 much powder. Prejudging the amount of water available and needed is also not a way to start. Comment: Why just summer or fall? Why just pulses? 200 TAF of water down the Sacramento River or 1000 cfs for 100 days is a lot of water, which would provide measurable benefit to the river, Delta, and Bay particularly in a dry year. And why just 200 TAF, when ag takes more than 10,000 TAF? Comment: There is no evidence that smelt survive the hot summers in the Yolo Bypass or in the Delta. The most important action is to keep the low salinity zone habitat of the smelt downstream of the Delta in Suisun Bay with more outflow in drier years. 250 TAF of water (see next quote) could help do this in many years. Comment: Why is water not available to maintain key beneficial uses protected by State laws, and why is it not free? Why is more of the natural flow being allocated to water rights each year? Why isn’t water used for human use not taxed like the State’s carbon tax to help purchase more water rights and restore more habitat lost to development? Why aren’t the co-equal goals to protect the environment being addressed? Comments: A “little better” and “some incremental progress” are not going to cut it. The interface of science and policy is longstanding: it is the policy and management that have prioritized the water supply side of resource allocation. Comment: There are a dozen metrics that provide a measure of smelt performance. These metrics have been available for a decade or more. For each identified action, managers could apply one or more of these metrics to numerically assess the response in the smelt population. Comment: the tools and metrics are well developed, but objectives are lacking, as are measures that protect the smelt and their habitat. Comment: The bloom mentioned was minor and occurred where there were no smelt. At the same time, a larger independent bloom occurred downstream in the low salinity zone as a result of classic estuary dynamics (an unrelated pulse of outflow4), along with a recent high abundance of young smelt triggered by wet year Delta hydrodynamics. Comment: Much of the Recovery Plan was not adopted or updated over the past two decades based on performance. The key specified action in the plan was simply keeping the low salinity zone in Suisun Bay rather than upstream in the Delta. Instead, dry water year water allocations were almost entirely allotted to water supply, to the detriment of ecosystem. Comment: I am not sure about this general statement. The problem really is the plans – they do not provide the protection the smelt need. The Recovery Plan and water quality standards are over 20 years old. The OCAP biological opinion in 2008 lacked adequate protections and is being revised. Comment: This is really a bad excuse for not protecting the Delta smelt, which was originally chosen as the “canary in the coal mine” for the Bay-Delta and all its species. I know of no species hurt by smelt protective actions, but many that benefit from them. Comment: I have been involved in such sit-downs for the Delta for 40 years. I have seen many grand compromises that keep cutting each reboot of the Bay-Delta in half. One half to the tenth power is a tenth of one percent. There is no optimizing for all. Something has to give. Comment: We all do not share the love for “the little three inch fish”. I doubt the new Secretary of the Interior will share the love that Mr. Souza holds for Delta smelt. Comment: My, my. Enough from Mr. Souza. The Klamath River Chinook salmon fall run is expected to be a record low in 2017.1 Predictions are near or below the record low run in 1992. These record low runs followed extended droughts from 2013 to 2015 and 1990 to 1992, respectively. Tribal fishery scientists such as Michael Belchik of the Yurok Tribe stated the low return of spawners is the result of several severe years of drought conditions and river management practices, which caused the waters to warm and become hot beds for toxic algae and deadly parasites. 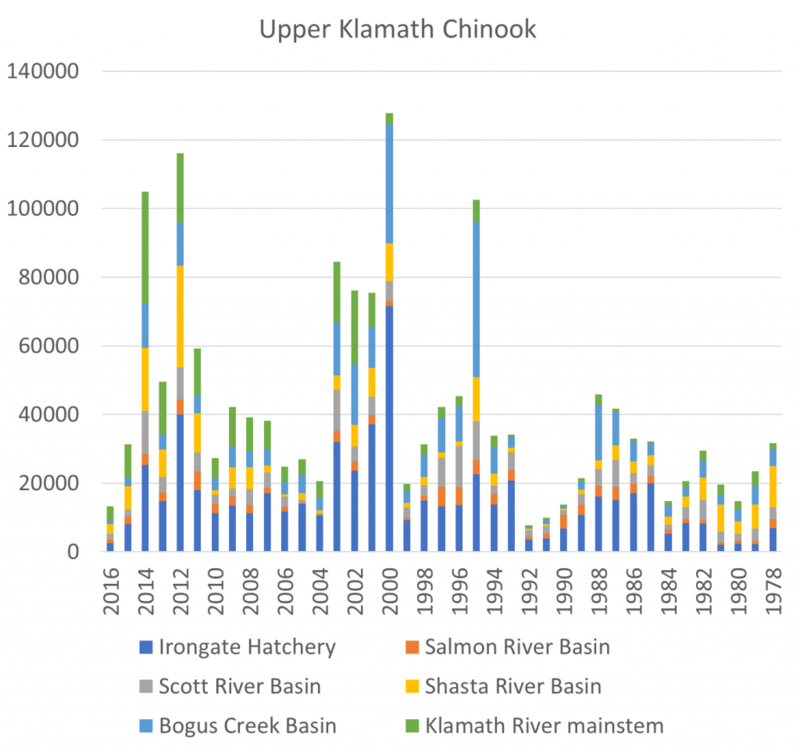 In 2014 and 2015, up to 90 percent of juvenile Chinook salmon on the Klamath River are estimated to have died from an intestinal parasite, believed to be a major cause for this year’s low run, as were poor ocean conditions…. “All these things together conspire to create a real catastrophe for fisheries,” Karuk Tribe Natural Resources Policy Advisor Craig Tucker said. Organizations see dam removal and changes to the federal government’s management of the river as being key solutions to the underlying causes of this year’s low salmon return.” “The solution for this problem is to remove the Klamath dams now,” Pacific Coast Federation of Fishermen’s Association Executive Director Noah Oppenheim said. A UC Davis study placed some of the blame on hatcheries. “My results suggest that hatcheries’ harm to wild salmonids spans the entire Klamath River basin. For fall Chinook salmon, the decline is concurrent with increases in hatchery returns – a trend that could lead to a homogenous population of hatchery-reared Chinook”. Having been involved in the Klamath River for 40 years, I provide some of my own insights in this post. In follow-up posts, I will take a closer look at the Scott and Shasta rivers, the two main salmon tributaries of the upper Klamath that contribute substantially to the overall upper Klamath salmon run. 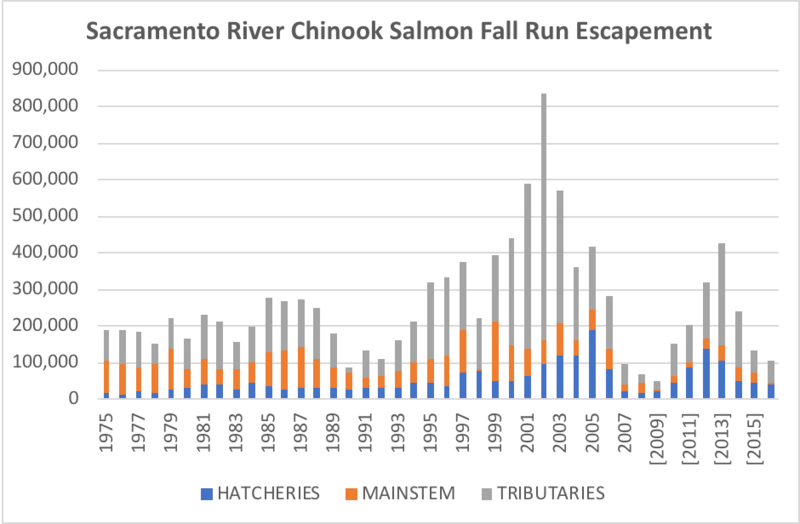 A summary of the overall Klamath salmon run escapement numbers or spawner estimates for the past 40 years is shown in Figure 1. The spawning numbers in 2016 were low, yet this drop came only two and four years after near record runs. 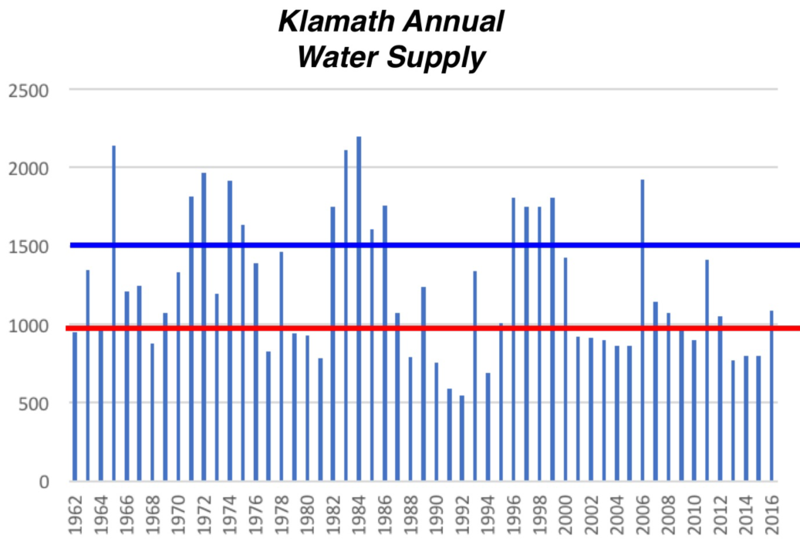 Contributions for all six upper Klamath subcomponents in 2016 were down substantially from 2014. Predictions of a poor run in 2017 come from the low number of two-year-old “jack” salmon in the 2016 spawning run. The question is: why did the strong run in 2014 produce the expected record low run in 2017? And why did the strong run in 2012 produce the weak run in 2015? And on the flip-side, why were the runs in 2012 and 2014 so strong, especially given they occurred during the recent multiyear drought? A close look at the spawner-recruit relationship (Figure 2), how recruits are related to the number of spawners three years earlier, provides further insight into factors controlling long-term recruitment. 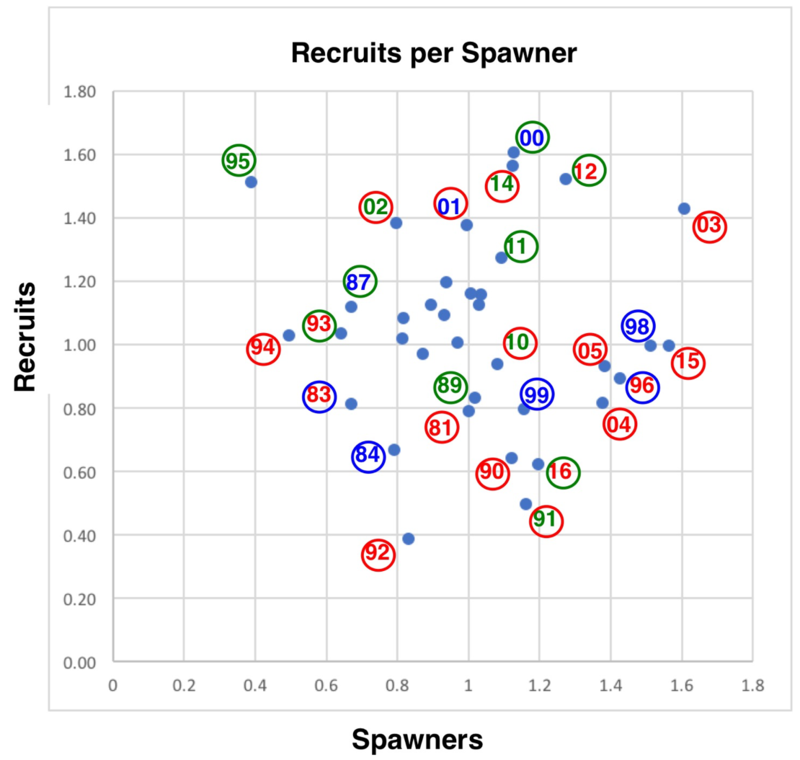 The spawner-recruit relationship is weak at best, reflecting the fact that estimates might be poor and/or that other factors are more important than just the number of spawners. The 1995 recovery after the record low 1992 run provides compelling evidence that survival and recovery can be strong even from the weakest of runs (with strong hatchery support – see hatchery component for 1995 in Figure 1). Unfortunately, 2017 appears to suggest that strong runs can produce very weak returns three years later if other factors such as drought are dominant. The population crashes (2016, 2004, 1992) occurred after multi-year droughts (Figure 3). Multiyear effects compound changes to sediment, pathogens, and water quality, the suggested causes of these crashes. Population expansions (2012-2014, 2007-2009, 2000-2003, 1995-1997, 1985-1988) occur after a series of wetter years. There may be some underlying effect of floods, as indicated by the poor run in 1999, a consequence of the New Year 1997 flood that washed out the fall 1996 spawn. The poor run in 2016 and the expected record low run in 2017, in addition to the effects of the 2013-2015 drought, may have been affected by poor ocean conditions, as was believed to be the case in the poorer than expected 2004-2006 runs. Several factors potentially affect production or survival per spawner: conditions during the spawning run (flows, water temperature, disease, upstream passage hinderances, etc), first year rearing and emigration conditions (flows, water temperature, predators, prey, disease, toxins, etc), and ocean conditions. It is likely that flows throughout the water year (Figure 4) have some effect on survival of the affected or subsequent brood years. The contribution of the Shasta River appears to have increased in recent years, likely as a result of the Nature Conservancy’s efforts at Big Springs (more on this in an upcoming post). Overall, the droughts of 1990-1992 and 2013-2015 (Figure 3) were likely the single most important factors in the upper Klamath Chinook salmon population dynamics. The role of the Irongate Hatchery contributions seems relatively stable and a likely important contributor to recoveries after drought. I was unable to determine the contribution of hatchery salmon to the other components of the run, but it is likely a large factor in the Bogus Creek and upper Klamath elements. It is possibly a lesser factor in the Salmon, Scott, and Shasta river elements, which speaks to the importance of these potentially “wild” runs. Knowing a good run was occurring in drought year 2014, managers could have done more to protect the spawners, eggs-embryos, and subsequent rearing-emigrating juveniles with better flows and water quality. Perhaps the recent federal court decision may help ensure future protections. In poor water supply years like 1990-1992 and 2013-2015 (Figures 3 and 4), water managers simply must provide protections for salmon. Future removal of the four dams may help reduce the adverse multiyear effect of droughts on disease and water quality and may provide additional spawning and rearing habitat. Much more could be done to increase run components from the Scott and Shasta rivers (more on this in upcoming posts). The hatchery program is long overdue for reform and upgrade. The program should shift from production to conservation of fall-run and spring-run Chinook, Coho and steelhead. These and other suggestions are discussed in a prior post. Figure 2. 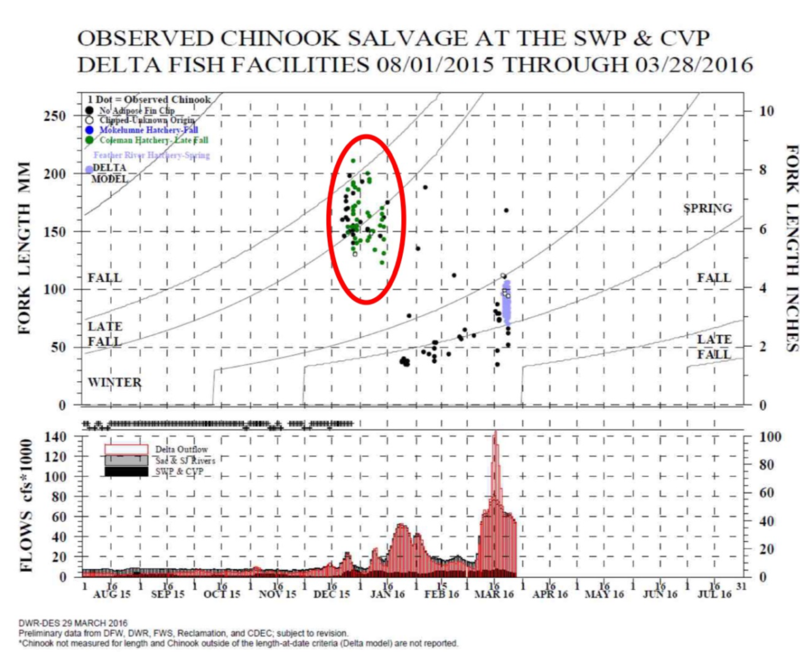 Spawner-Recruit relationship for upper Klamath River fall-run Chinook salmon population. The number is the transformed (log10X – 3.5) escapement estimate for the fall of that year as shown in Figure 1. The color represents winter-spring hydrology conditions in the Klamath River two years earlier when this brood year was rearing in river habitats. Red is dry, green is intermediate, and blue is wet (from Figure 3). Circle color represents late summer water year conditions in numbered year. For example: year 92 represents the recruits in fall 1992 from brood-year 1989 spawn that reared in 1990 winter-spring (red dry year); the red circle represents dry conditions in late summer of that water year (1992). 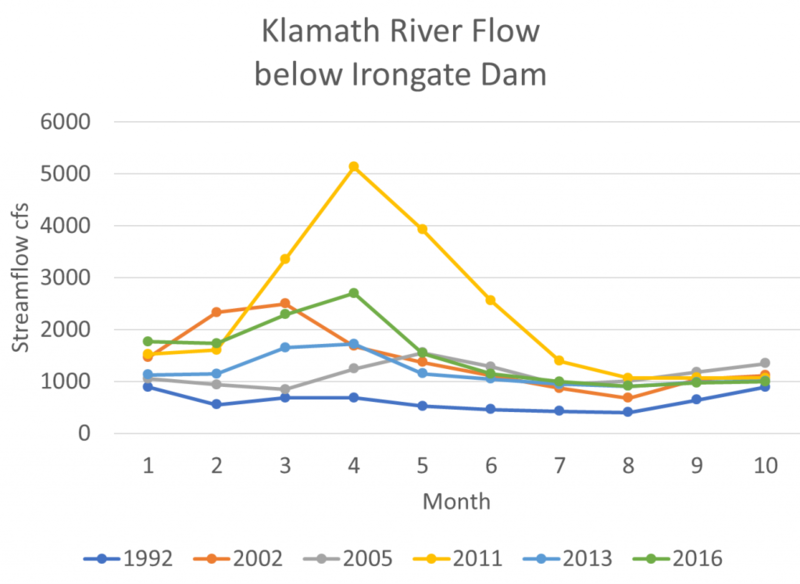 Note that the spawning run for 2002, the year the large die-off of adult salmon occurred in the lower river due to low flow and high water temperatures, likely contributed to the poor returns (recruits) in 2004 and 2005. Figure 4. Monthly average flow (cfs) in Klamath River below Irongate Dam in selected years. Year 2011 was a wetter year. Year 1992 was a critically dry year. Years 2002, 2005, and 2013 were dry years. Year 2016 was an intermediate water year. Source: www.waterdata.usgs.gov.